IN a dramatic move, Rajoy has revealed the king has not asked him to form a government. 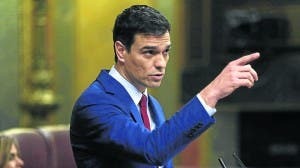 The favoured candidate to form a government is PSOE leader Pedro Sanchez. Sanchez has asked for three to four weeks to form a coalition government. The horrible sound of scraping barrels…. The kiss of death. Good luck with that lot Spain, you are going to need it! Sad but true, the PSOE and PP are both totally corrupt. More of the same for Spain.